Image caption Dr Nick Evans said Hull played "a pivotal role in the peopling of America"
Hull's role in the movement of 400,000 Finns emigrating to a new life in the United States is to be marked with the unveiling of a commemorative plaque. 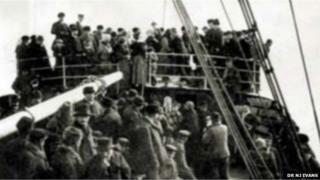 Between 1891 and 1924 they were part of more than two million Baltic emigrants to go through the East Yorkshire port. This migration played "a pivotal role in the peopling of America," Dr Nick Evans of the University of Hull said. Pekka Huhtaniemi, Finnish ambassador to the UK, will unveil the plaque at the city's Maritime Buildings later. Mr Huhtaniemi is to also open a new exhibition about the history between Finland and Hull. Dr Evans, of the university's department of history, said: "The Finns travelled to Hull because of the steamship connections between the Baltic and Hull. "It was transit point for these soon-to-be American immigrants." The migration was focussed on particular times of the year, in the first week of June up to 10,000 Finns could arrive in just two days in a city. There was a special platform at the railway station just for the migrants to catch trains to ports, including Liverpool, Southampton and Glasgow, for the Atlantic passage. About 95% of the people from the area of modern Finland who emigrated to America passed through Hull, according to the historian. Some Finnish emigrants that had passed through Hull died when the liner Titanic was sunk by an iceberg in 1912. The mass movements came to a virtual end because of the outbreak of World War One in 1914 and the sinking of the liner Lusitania by the Germans as it returned from America in 1915, Dr Evans added. Then in 1924 the United States introduced a law ending European immigration. Hull imported large quantities of goods, particularly timber, from the Baltic and the trade continues to this day.